With the environment-friendly initiative, Apple was able to void over 1.5 million metric tons of greenhouse gases from being emitted in 2017. Besides solar and windmill farms, Apple is also investing in emerging technologies like biogas fuel cells, micro-hydro generation systems and energy storage capability to supply power to local communities, states, and even countries. American technology giant, Apple on Tuesday announced reaching a new milestone as nine of its global partner supply facilities have embraced green technology thus increasing the tally to 23 affiliated units, who are committed to using 100% renewable energy. Apple also revealed that all of its retail stores, offices, data centers and co-located facilities in 43 countries — including the US, UK, China, and India are completely powered by environment-friendly energy. "We're committed to leaving the world better than we found it. After years of hard work we're proud to have reached this significant milestone," Tim Cook, Apple's CEO said in a statement. Through this initiative, clean energy from supplier projects helped avoid over 1.5 million metric tons of greenhouse gases from being emitted in 2017 — the equivalent of taking more than 300,000 cars off the road, the company claims. It is pertinent to mention that Apple has taken initiatives to cut down on unnecessary consumption of power in their offices, as well. International Business Times India Edition was recently invited to Apple's App Accelerator in Bengaluru. We witnessed one of the company's energy-saving mechanism at work. The guests were asked to wait in the conference room before the company could start a presentation on the App Accelerator's one-year completion. As everyone became engrossed in their smartphones on being left alone, a while later the lights in the room dimmed. The mystery was later cleared when we were informed that the room was fixed with sensors and if it sensed no movement in the hall for a pre-set time, the lights turned themselves off automatically. Besides improving its own office spaces, Apple and the partner companies have taken up green projects to supply power to local communities, states, and even countries. 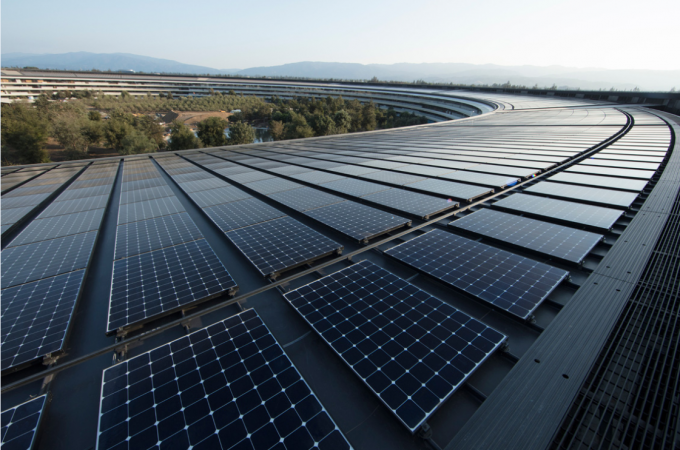 In addition to conventional solar arrays and wind farms, Apple is investing in emerging technologies like biogas fuel cells, micro-hydro generation systems and energy storage technologies. In a related development, Apple unveiled new iPhone 8, 8 Plus (Product) Red series, earlier in the week. The special crimson iPhone edition is for a noble cause. Apple is one of the sponsors for (RED) organization running life-saving HIV/AIDS programs in sub-Saharan Africa, which is understood to be the home to more than two-thirds of the world's HIV-positive population. A portion of proceeds of all (Product) Red purchases will go directly to the global fund HIV/AIDS grants that provide testing, counseling, treatment and prevention programs with a specific focus on eliminating transmission of the virus from mothers to their babies.